Yesterday afternoon, emboldened by the sunny weather and my new Car2Go membership, I departed the office for some lunchtime reconaissance. 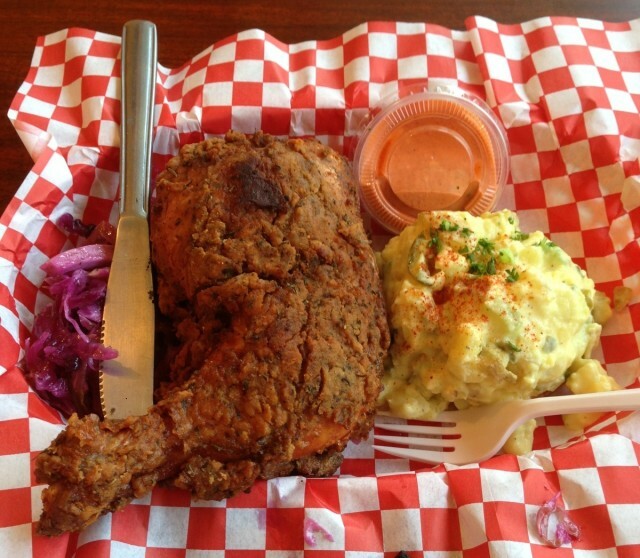 The original Meander's Kitchen space at 6032 California Ave in West Seattle has been reborn as Harry's Chicken Joint. Outside, the Jade West sign from bygone days is still up, but unlike its immediate predecessor, Harry's has an actual sign with its own actual name on it. It was strange to see the red Formica counter and those curious knee-high stools under new ownership, but perhaps the most conspicuous change is the set of massive cast-iron deep friers atop the range. Since opening last month, owner Bruce Cougan (Harry's is named for his dad) gets gently razzed about not having an actual deep fryer. However he has no plans to deviate from his stovetop vessels. As you may have guessed, the house specialty here is fried chicken, specifically a thigh and drumstick, still attached. These meaty behemoths get brined overnight, smoked, dredged twice, and fried. Keeping a bit of the backbone really helps with flavor, says Cougan. And the hulking result looks like something you would brandish at a medieval feast and has more skin than a really good Game of Thrones episode. A $12 quarter combo comes with two sides; yes, I know it's hip to be over truffle-flavored things, but I liked its subtlety in the potato salad, and the mayo-less slaw lightened up the proceedings nicely. The spoons and forks are of the disposable/compostable variety, but Cougan knows to hand out actual metal knives when it comes time to attack these mammoth chicken plates. Cougan recently added lunch hours, and is rolling out an expanded menu that includes several po'boys (oyster, shrimp, and pulled pork). He also serves a grilled cheese made with smoked Tillamook cheddar and promises Sunday sit-down dinners in the future. Keep tabs on new developments on Facebook. Right now Harry's is open Tuesday through Friday from 11 to 9 and Saturdays from 4 to 9 (and it takes plastic). West Seattle Blog has a little more background.